The name says it all at Desert Paradise Resort. 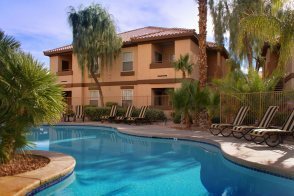 Tucked away, just a short drive west of the Las Vegas Strip, this resort features nicely appointed one- and two-bedroom condos with full kitchens, a beautiful outdoor pool with waterfall, fitness center, outdoor BBQ areas and helpful concierge services. 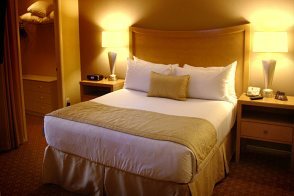 Guests also enjoy complimentary on-site parking, mid-week housekeeping and a business center. You’ll feel right at home in your spacious condo, which boasts plush Simmons Westbury Collection king beds, comfortable living rooms with sofa beds and even washer and dryer sets (now that makes packing easier!). 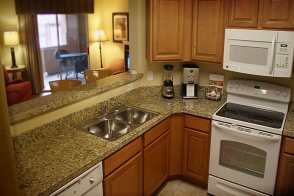 The full kitchens are stocked with dishes, silverware, cooking utensils and appliances include microwaves, ovens, stovetops, refrigerators, dishwashers, coffee makers and blenders—margaritas, anyone? 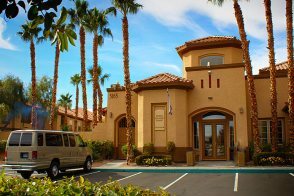 Desert Paradise Resort is the perfect getaway for travelers wanting to enjoy all the excitement of Las Vegas, but also be able to escape the crowds for some rest and relaxation off the Strip. No, but you're within walking distance of a China Star buffet, O'Aces Bar & Grill and Roberto's Taco Shop. No, but there's a movie theater and entertainment at the nearby Orleans -- and you'll be just a short drive away from the Strip's many showrooms, lounges and comedy clubs. No, but there are numerous bars and nightclubs to party at on the Strip. Yes, an outdoor heated pool and hot tub. No, but there is a spa in The Orleans, which is in the vicinity. No, but The Forum Shoppes at Caesars and The Shoppes at Mandalay Place are a short drive away. Yes, wireless internet access is included in the resort fee. 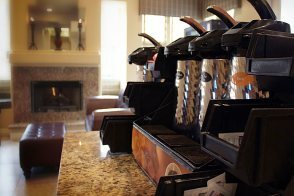 Full-service concierge, mid-week maid service, safe-deposit boxes and wake-up calls. No, but free parking is available in the surrounding surface parking lots. No, but the hotel staff can help you arrange transportation. The maximum total number of guests (adults and children) in a one-bedroom condo is four and in a two-bedroom condo is six. Hotel requires a credit or debit card for incidental charges. 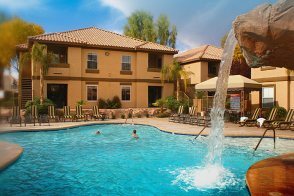 Resort fee Desert Paradise Resort by Diamond Resorts has a $23.95 per room, per night resort fee. This fee is not included in your reservation and will be collected by the hotel. This 1,262-square-foot condo comes with two bedrooms. 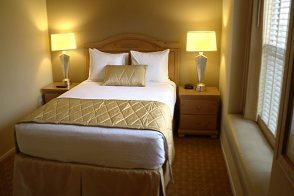 There's a Simmons Westbury Collection king-sized bed in the master bedroom and a standard queen-sized bed in the second bedroom. 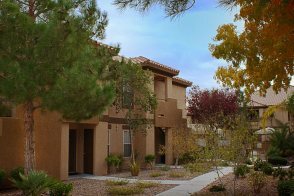 In addition to the bedrooms, the condo has a fully equipped kitchen (blender, coffeemaker, microwave, oven and stove, refrigerator, toaster, dishwasher, dishes, cooking utensils and silverware), a dining area with seating for six and a living room with a coffee table, an upholstered chair and a sofa bed. There are three remote-controlled TVs -- one with a DVD player. 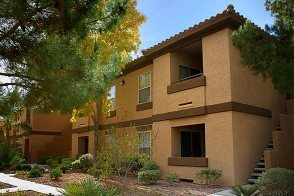 Other amenities include ceiling fans and a full-size washer and dryer. 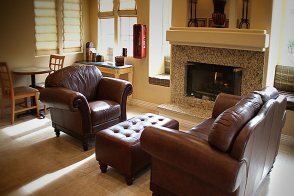 Guests will also enjoy relaxing on either a patio or balcony. There are two full bathrooms. The master bathroom boasts a garden tub and the second bathroom has a combined tub/shower.